With the London termini found to be wanting, for the new HSR2, then we turn to The West Midlands´ proposals to look at them critically. The line from London needs a new station called Birmingham Interchange some distance from Birmingham International Airport station to which it is meant to connect. 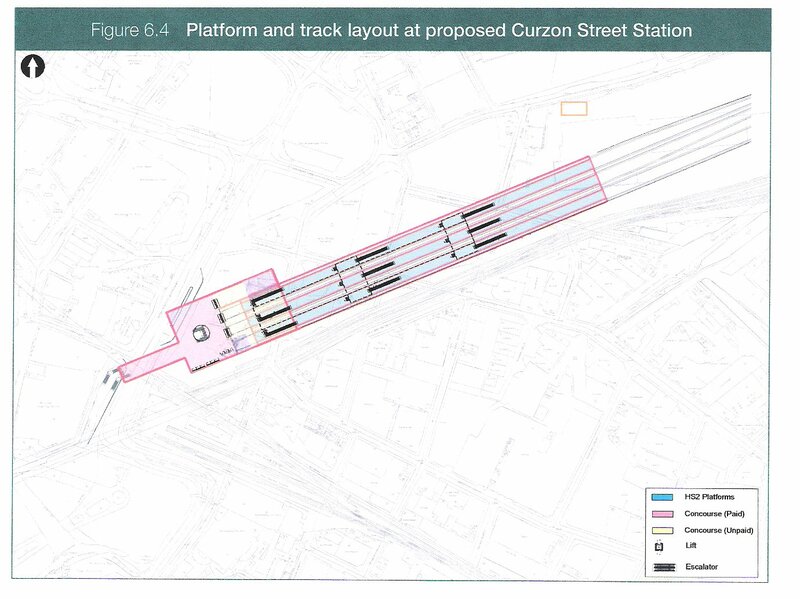 This is ridiculous duplication and waste - the proposed station is not even on the west side of the M42. Approaching the West Midlands conurbation it is logical to reduce speed to stop at such a station so a lower line speed limit can be applied thus aiding the flexibility of the track layout to permit its entry into Birmingham International Airport station. The trains could then continue up to Lichfield as envisaged. The paper gives us to understand that trains into Birmingham and those onwards to places further north would all stop at the Interchange thus making this proposal realistic. This would then make Birmingham International the best option (a) to serve the airport and (b) to serve as an out of centre station for those trains that continue northwards. 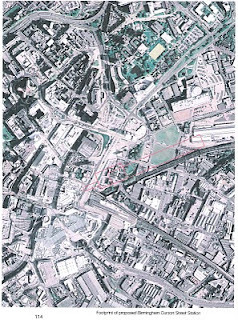 As can be seen from the DfT proposal on the map from the HSR2 line into central Birmingham a chord is constructed at Water Orton to make use of the present corridor into the centre of the city. The disadvantage of this is that it makes the line a cul-de-sac. 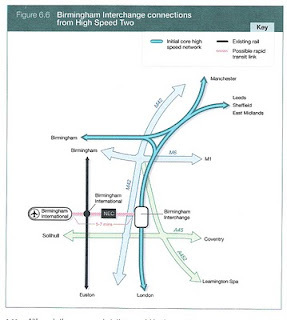 This makes it essential for any traffic from the south to enter down the corridor and if that trafiic is intended to continue northwards then it has to backtrack through the same corridor to connect with HSR2 on towards Lichfield. 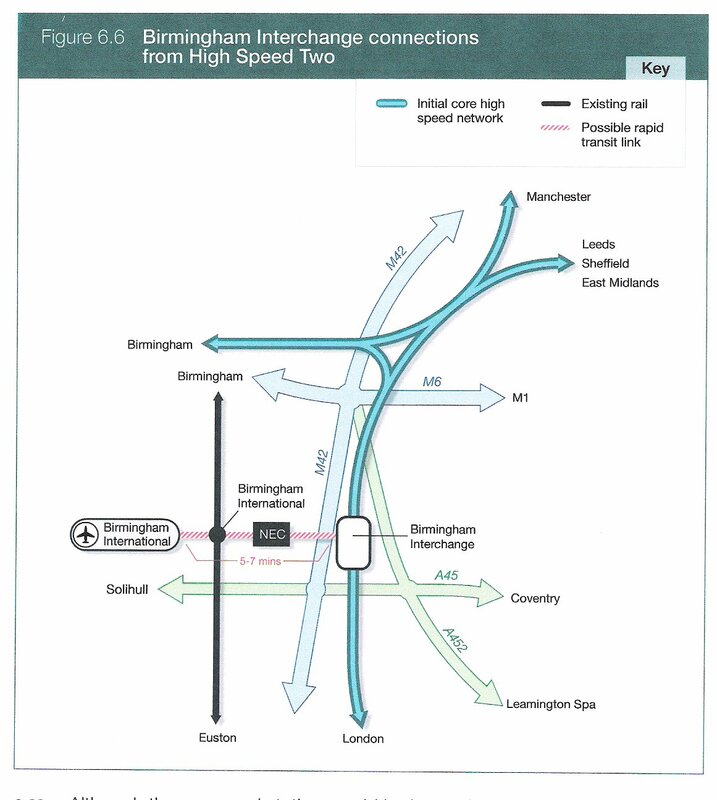 Thus with this proposal the Birmingham International station is the only realistic option for through traffic. However, that does not necessarily have to be the case. 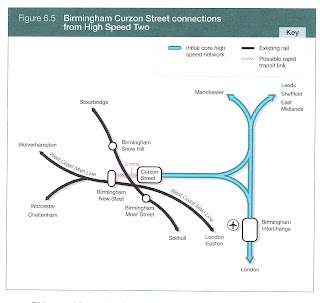 If HSR2 were directed through Birmingham International then it would connect to the WCML into the city centre. 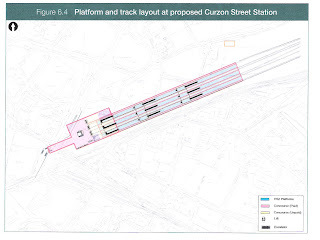 Whether the services terminate at New Street or not wouild depend on the need or desire to construct interconnecting lines in central Birmingham or even a new station at Curzon Street/Fazeley Street. Is this a realistic option? or can the present inner-city stations be used? "Birmingham New Street is largely at full capaci ty. The local timetable has been optimised. It would be difficult to operate extra terminating trains. The Birmingham Gateway project will resolve the passenger congestion issues at the station but is not designed to increase train capacity (except in so far that it assists with passenger (un)loading). 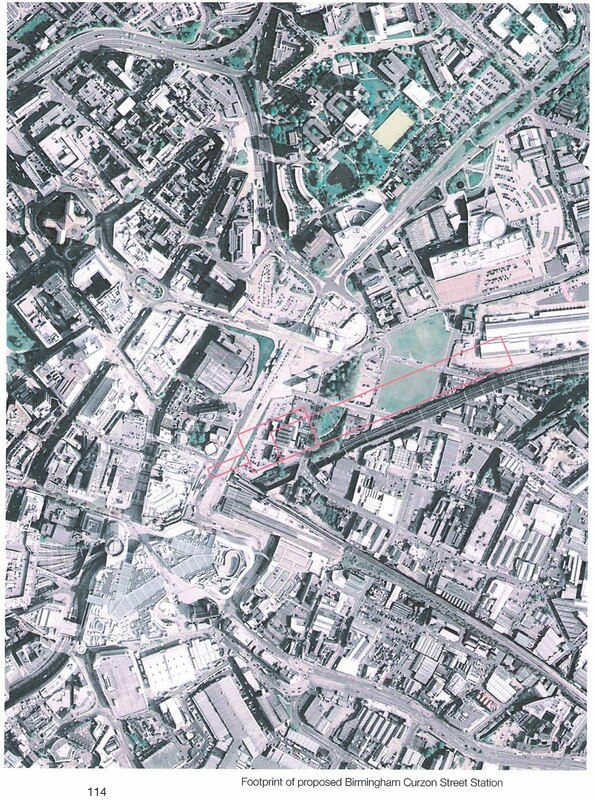 Given the constrained nature of the Birmingham New Street site (it is largely underground and surrounded by tall buildings); it is probably more cost effective to build extra platforming capacity elsewhere in Birmingham. Birmingham has three City Centre stations. In addition to Birmingham New Street station, there is Birmingham Moor St and Birmingham Snow Hill. One advantage of Birmingham New Street is train connectivity. Because many services pass through New Street there will remain a level of demand of for London services to remain at New Street to allow connections with local and inter-regional services. Birmingham New Street and Birmingham Moor Street are within sight of each other. A direct pedestrian route exists between the stations takes less than 5 minutes. A mobility impaired route has also been built. Having an extra 2 tph call at Moor St will require extra platform capacity. Three new platforms have already been built and need simply to be (extended and) reconnected. Snow Hill was considered as a terminus but rejected because of the difficulty of pathing more trains through Snow Hill tunnel and the lack of platforming capacity. Work commissioned by Centro seems to indicate that more platforms could be built to the west should the three platforms be required by Chiltern Railways"
The traffic pattern, as envisaged by the ATKINS report,offers various alternatives (packages) depending on how much investment is involved (not just on the Chiltern HSR2 line). As we indicated in the previous blog (White Paper 2) the most likely options are Packages 3 and 4(Appendix A pages 77-83). These offer services from the London termini, Marylebone, Paddington and Euston into the Birmingham termini, New Street and Moor street. The destination mix depends on the number of services offered in total. 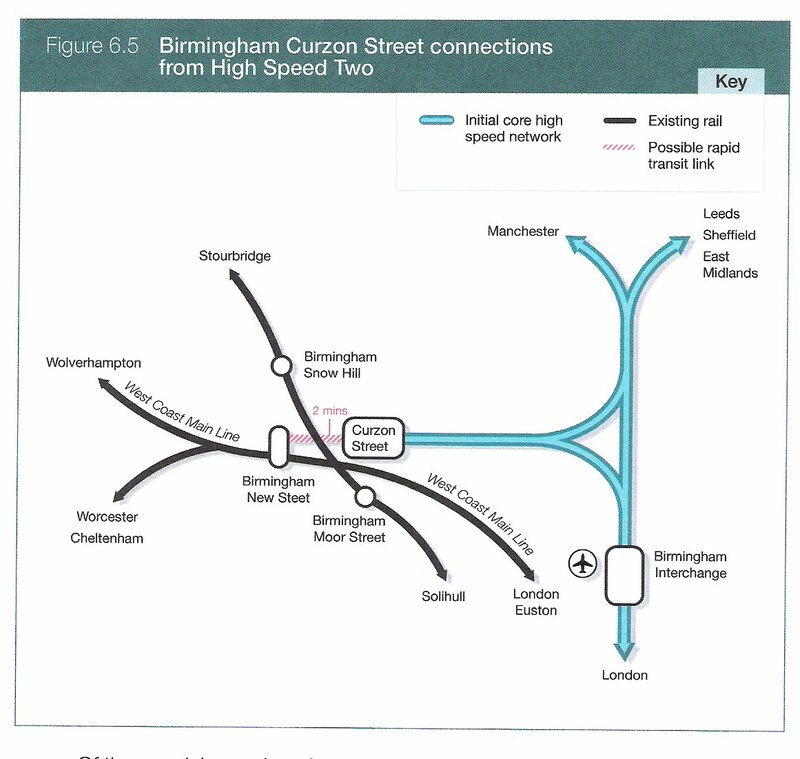 However, in this document There is no proposal to build a new station in Birmingham and the Chiltern line would have only the necessary investment to upgrade - not a new HSR line. The White Paper offers no clarity on the service patterns and says no more than that a new station is to be built and all Birmingham HS services will go there. More work has to be done on this. It is far too vague. The ATKINS proposals offer concrete solutions and are compatible with the construction of the HSR2. The public deserves a better thought out document.